Sometimes we have the urge to start opening and reading our Bible that has been seating in our house for ages. A calling inside attracts us to grab that powerful book of prayers, learning, and verses that will guide us in our lives. But, often we neglect that calling and disregard that chance when we can connect with God because most of us find reading the Bible a bit boring and it makes us sleepy. Or we use our daily tasks as an excuse just to avoid the time when we can bond with God by reading the Bible. I myself do experience that same feeling of not being in the mood to read the bible even if I know that it will help me improve my overall mindset and relationship with God. Fortunately, upon reading some articles I was blessed with one principle that may help us improve our reading habit. This article will help you find the best Bibles for journaling and explain why that is important! Journaling is a record or written collection of thoughts and anything that you have in mind. A lot of renowned scholars actually claim that journaling is one of the keys to their success and memory retention. Aside from your personal records, the principle of journaling can help you with your daily Bible reading as well. You can use this process to jot down your reflections and devotions. Since journaling is proven to aid one’s focus on a certain goal, it is ideal for helping you maintain a healthy Bible reading habit. To help you start with your new Bible journaling routine, it is best to use the perfect Bible for you. Ordinary and simple Bibles are welcome in your new journey but finding the best Bibles for journaling will help you sustain a good practice plus it’s exciting and fun to use as well. 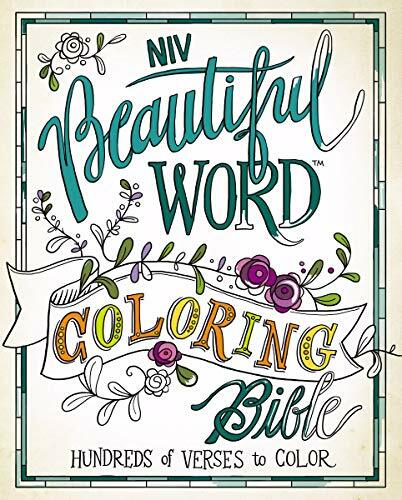 The NIV Beautiful Word Coloring Bible by Zondervan is one more addition to the market for persons who like artistic journaling, coloring and who want this incorporated in their Bible. While this Bible does not include full-color artwork like its predecessor, what it does include is line drawings throughout the Bible. These include text illustrations in the margins as well as a couple of full-page drawings as well. This is one of the best Bibles for journaling for those who enjoy adding a little color. The Bible is chock filled with hundreds of detailed illustrated verses that are ready to color. It can serve as a great stress reliever for adults who want to enjoy the task of coloring while reading the word of God. This Bible is suitable for persons of all ages and also is suitable for both genders. Binding and Cover – the NIV, Beautiful Word Coloring Bible comes in a hardcover edition. The Bible weighs in at 3lbs and 4 ounces and measures 8.5×6.75×2 inches. It features glued binding so that it will easily lay flat. 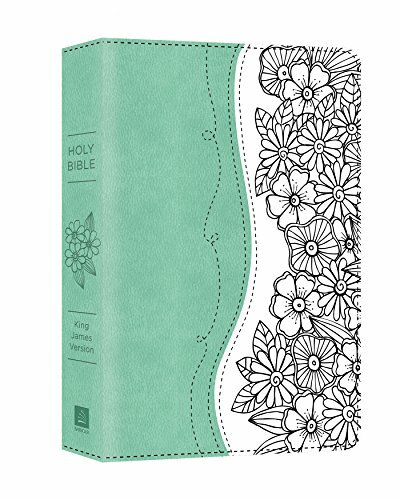 The Bible comes with a dust jacket with Proverbs 3:5-6 illustrated in aqua and beige coloring. Paper and Typography – this Bible features thick paper, maybe around 40gsm by the feel of it. It is a true white colored paper and pages are not noisy when turning. This Bible features an 8-point type font and is set in a single column format. The margins found in this Bible are 2.25 inches wide and lines are evenly spaced. On pages without illustrations, you will find 40 lines. Each Book of the Bible starts at the top of a new page so that you have added room for journaling at the end of some Books. Quotes and letters are indented in an effort to make them stand out and poems are set in stanza form. Artwork – Most margins of the Zondervan’s NIV Beautiful Word Coloring Bible are filled with illustrated verses for you to color. There are a number of pages with empty margins where you can make your notes and note insights as the word comes alive to you. Among the types of artwork, you will find throughout the bible there are simply drawn lettering to color, illustrated highlighted verses, full-page illustrations to color and some two pages spreads. In the back of the Bible, you will find an index to the different illustrations categorized by artist. The NIV, Beautiful Word Coloring Bible by Zondervan is the second version of the Beautiful Word Bible. The new version is thicker than the previous bible and a little heavier. The added width and weight all come from the better-quality paper used in this version. This paper makes journaling and coloring a more fun experience with no bleeding through the paper and more vibrant looking finished products. If you want a bible with a top quality paper that will stand the test of your journaling and coloring then this is the best bible for journaling. This is a great choice for those looking for a journaling and coloring Bible with the NIV translation. If you liked the original Beautiful Word Bible but hoped for a thicker paper you will also enjoy this version. It is a great choice for people of all ages and for both genders who enjoy reading the Bible and coloring and journaling. Those looking for a new way to meditate and interact with the word of God will enjoy The Personal Reflections KJV Bible. The bible is a large one with a lot of extra space in its margins. This space can be used by the reader to make notes, color, create artwork, create word art or anything that the spirit moves them to. This hardcover Bible is designed specifically for those who like to create as they read. The bible is oversized and features large margins so you have space to create your own inspired works of art or to write down your insights as the spirit leads you. The pages are thick so they can stand the test of your pens, crayons, markers and the test of frequent reading. This Bible is suitable for readers of different age groups and is also useful for both male and female readers as well. Product Info – The Personal Reflections KJV Bible is a hardcover bible which features 1152 pages. The spine is sewn and there is an included ribbon marker. You will find the pages with 8-point size type font and words of Jesus are shown in red. The bible measures 9.5×7.25×2 inches in size. Personalization – Not only is this one of the best Bibles for journaling on the inside but you also have the option for personalization of the cover of the Bible. This makes it a great choice for artists of all kinds. You can personalize the cover with your choice of markers, pens or crayons so it is uniquely your very own Bible at the end of the entire reading experience. Translation – The Personal Reflections KJV Bible features the King James Version translation as its name suggests. This version boasts itself as being the preserved and original word of God. This version would be more suited for those who have a deep knowledge of the Bible already and may prove a bit confusing for beginners. It provides quotes from Jesus in red lettering so the reader can always distinguish. 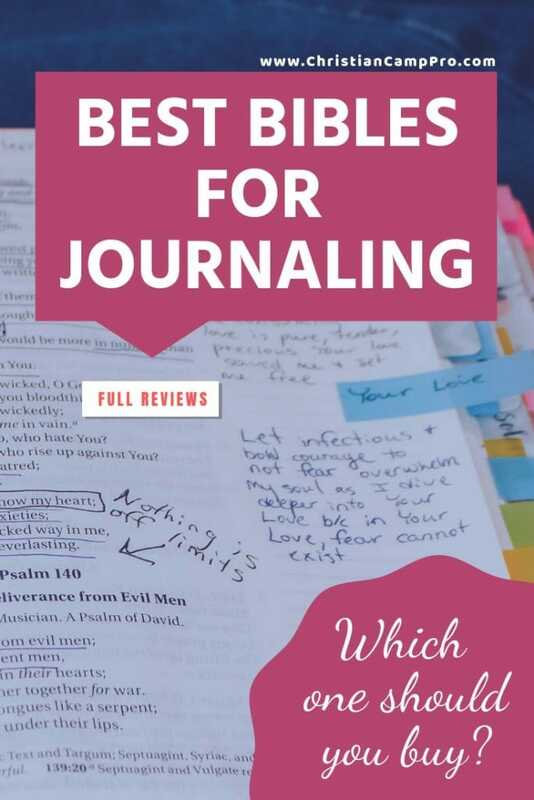 Journaling – This bible is one of the best Bibles for journaling because of the quality of the paper used within the covers. The paper is not your typical Bible page paper and is thicker and better in quality than most Bibles on the marker. The quality of the paper is so good it will stand up to gel pens and your everyday markers in ways that your regular Bible just will not. For the creative journaling lover, this is definitely the Bible they won’t want to miss out on. The Personal Reflections KJV Bible is the best bible for journaling for those who not just want to write what the spirit moves them to write. It is ideal for those who like to get creative and use colorful lettering. The pages are built tough to live through the use of permanent markers, gel ink pens, crayons, and other writing and decorating implements. The bible is not simply a pretty Bible or a Bible you can make pretty. It is still packed with the word of God and has many additional features to help you as you read the word of God. With an additional overview of the bible and Summaries for each book of the Bible, you will find a lot of additional content in this Bible to peruse. It would definitely make a good gift item and is a great personal purchase as well. The Thrive Journaling Bible for Women is designed for the woman who wants a closer walk with God and wants to know him more deeply. God wants each of his children to live a fulfilling and joy-filled flourishing life and this is best achieved with Christ in the center. Christ can only be in the center with daily communication and feeding on his word. Written by Sheri Rose Shepherd the Devotional reflects her aim of helping women who want to learn how to thrive in their relationship with Jesus Christ. This devotional will help the reader to see the eternal perspective and help them to reflect the glory of God in everything around them. 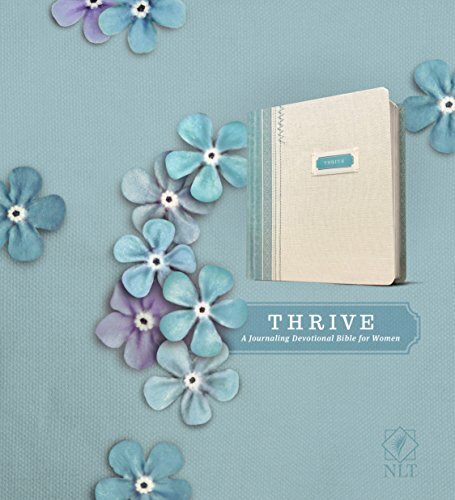 When you choose the Thrive Journaling Bible for Women you are opting for a year journey into a devotional that will capture your heart every day and help you to give it to Christ every day as you go through life utilizing its information to make the best of the life that Christ has given you. Daily Devotionals – Includes a devotional for each day of the year. Each devotional contains a key scripture along with a reflection from the author and a love letter from God. There is also a special prayer and a treasure of truth contained in each day’s devotional. Presentation – One thing about this Bible is that it is very simply feminine and while it is slightly oversized, it is very pretty. It comes with a chic natural canvas-like fabric along with blue decorative stitching. The fabric is durable giving the bible a durable touch. The Thrive tag is stitched into the front of the Bible and it features rounded corners along with cream page edges. Very pretty black and blue font with decorative elements in a shade of blue. The Thrive Journaling Bible for women comes with a matching ribbon market to finish off the feminine decorative touch. 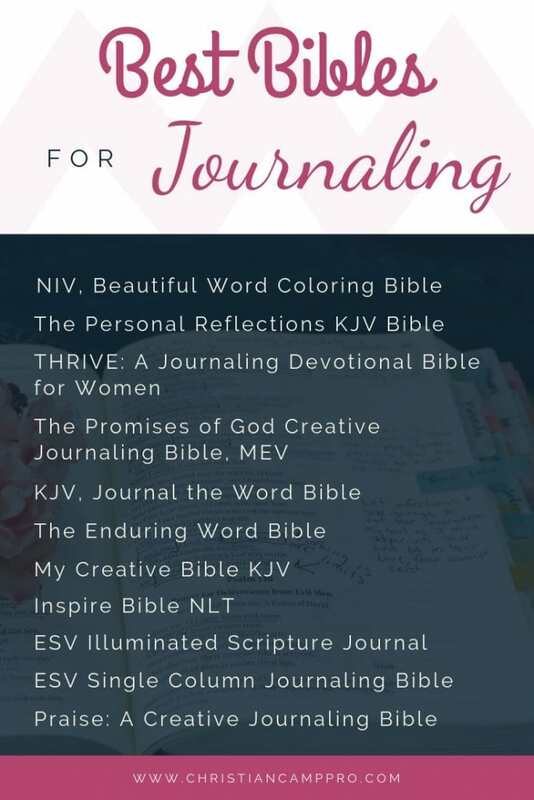 Content – the Thrive Journaling Bible for Women features 365 days of devotional content with each page having ideal amounts of spaces for your journaling. Journaling – Note lines are lightly lined and extra-wide for your journaling comfort. You will have enough space to record your favorite personal insights along with promises and prayers that come alive as you are inspired by the word. This is the ideal Bible for that lady that loves journaling. This journaling Bible allows you to study the word of God and make note of insight and key points that come to you while you study the word. There is ample space for note taking in this devotional Bible and the devotionals are all important topics that women will find very useful. 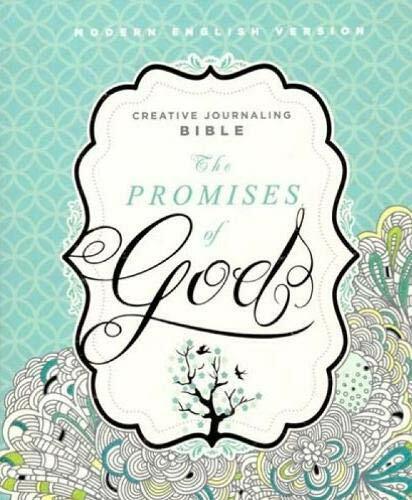 The Promises of God Creative Journaling Bible: Modern English Version is a very promising journaling Bible. It is a great choice as a journaling Bible especially for those who enjoy the clarity of the MEV translation. The Bible offers you enough space to input your very own artwork with its wide margin double column format. This Bible is one of the best Bibles for journaling for those who want a unique and creative art journaling Bible. While it does have a lot of space for you to create your very own artwork it also has a number of beautiful illustrations for you to color. You will find the Bible complete with blank and lined margins so you can doodle and draw as well as you can make notes as the word inspires you to do either. Layout and Paper Quality – The Promises of God Creative Journaling Bible: Modern English Version features creamy paper of approximately 38gsm. This is the standard for most journaling Bibles. The paper ensures that pages are easy to turn and the pages are laid out in a double column format. You will find poetry set in stanzas with book names and index verses in the upper outer corner while page numbers are in the upper inner corners. There are 9 blank pages one of which is slightly thicker than the others. There is a combination of unlined and lined margins which is quite unique to this journaling Bible. Binding and Cover – This aqua blue hardcover journaling Bible features white accents and has sewn binding. It comes complete with light yellow and white thick paper liners with diamonds and circles in the background. The sewn binding helps to keep the Bible strong so it can stand up to regular daily use and journaling. Artwork Options – Approximately 100 left margins of The Promises of God Creative Journaling Bible; Modern English Version come complete with line art which you can color. There are also some full-page illustrations that offer you more room to be creative. The pages with full-page illustrations have lined backs so you can use them for journaling or so you don’t have to worry about colors bleeding through. This is another unique attribute that makes this one of the best Bibles for journaling. You will find an illustrated title page in each of the Bible books with unique artworks that are relevant to the book. Marginal drawings are always on the left but full-page illustrations can be found on both the left and right side throughout the Bible. The KJV Journal the Word Bible gives its readers the ability to express themselves creatively each day while reading the word of God. Designed for journaling, the bible has ample room for your notes and for you to artistically capture your favorite verses. One of the unique options that this Bible allows is the fact that comes in a range of different covers so you can choose one that best suits your taste. Each unique cover is sophisticated and tasteful. Inside the covers, there is cream colored thick paper with ruled lines that are lightly colored allowing you to enhance your study as you read the word of God. Paper Quality and Typography – the KJV Journal the Word Bible is designed to endure note taking with thick cream-colored paper. The margins are wide and lined to help make the most of your journaling space. Thanks to the binding the book lays flat whether it is on your desk or in your hands and its 8-point type font is just the regular size you would find in your typical Bible. The text is black while words of Jesus are printed in red. The pages of the KJV Journal the Word Bible are soft and of more a cream color and not white like typical Bible pages. This adds to the unique design of the Bible and sets it apart from other Journaling Bibles currently on the market. Translation – Being that this Bible uses the Kings James Version translation you will find some words you may be unfamiliar with if this is your first time reading this version. This makes this journaling Bible an edition that is great for those who have studied the Bible before. This translation makes this one of the best Bibles for journaling and word study. If you are a Bible scholar you will definitely want to get this one on your bookshelf. Layout – You will find this Bible designed to be easy to read and to be easy to take your notes. The KJV Journal the Word Bible features a one-column layout. This type of layout ensures that the Bible is very readable which is essential for a bible that is considered one of the best Bibles for journaling. The topic titles are all bold for each chapter and this helps to improve readability as well. The pages have adequate margins to provide the reader with adequate journaling space. 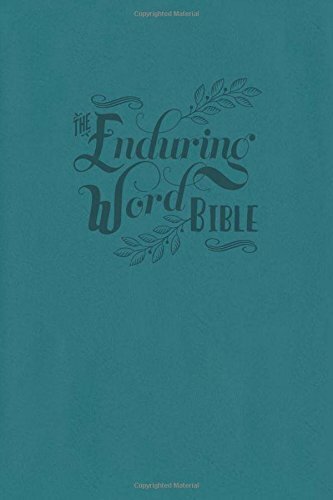 The Enduring Word Bible is a great purchase idea for anyone who wants a Bible that will help them to dive into the word of God, reading, meditating and really absorbing their spirituality. With this journaling Bible, you can doodle, draw, journal, mark and more while learning about God and what his word means for you. 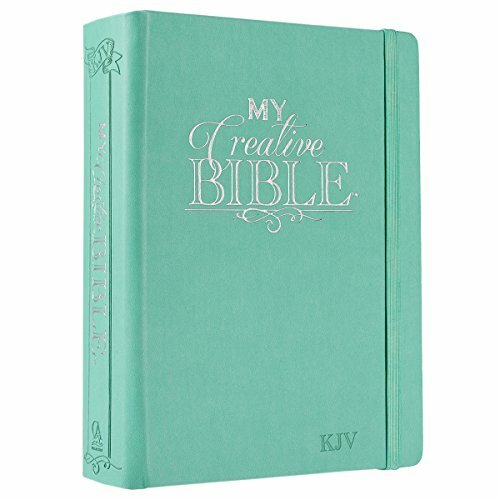 This creative journaling Bible is a great gift item and a great purchase for personal use as well. It can be used by will with its Bible verse illustrations in the margin that serve as a place to color as well as a way to really soak in a scripture and meditate on it. In addition to illustrations, the Bible also features wide ruled margins leaving you space for your notes and prayers as the Spirit inspires you to do so. Artwork – the Enduring Word Bible features artwork on its over 350 pages in the margins. The artwork included are very beautiful and offer you a creative way to meditate with the word of God. Along with the artwork you can find space for additional freehand drawing and doodling. Each Book of the Bible has its own illustrating that depicts the title of the Book. For example, in Luke, there is a bunch of grapes and stalks of wheat. Typography – The Enduring Word Bible has larger than usual type font. While most Bibles have 8-point type font this Bible features a font size of 9.55. This makes the Bible easy to read for even people who may have some amount of visual impairment if even just a little. Words of Jesus are printed in red allowing the reader to easily identify them. Format – This is one of the best Bibles for journaling thanks to its format. It features a single column format so there is more margin space for your journaling. With a lay-flat spine, the bible is great for laying on your desk and getting lost as you journal away. The bible is preceded by a presentation page which allows you to add a nice note if you want to give it as a gift. Paper – the Bible is complete with beautiful white to a cream-colored paper that is thick enough to ensure that your colors won’t bleed through. Translation – the Enduring Word Bible is published in the ESV translation. The English Standard Version was first published by Crossway in 2001. It is the Standard Version revision that uses the philosophy of an essentially literal translation. The translation makes the Bible easy to read even for those just delving into Bible study. Cover – The Enduring Word Bible comes with a soft leather cover that will lay flat while in use while ensuring its longevity and durability to stand the test of many days of diligent study. Durability is an important factor when considering which bible is the best bible for journaling. The My Creative Bible KJV offers readers a new and exciting journaling experience while they read the scripture of God. 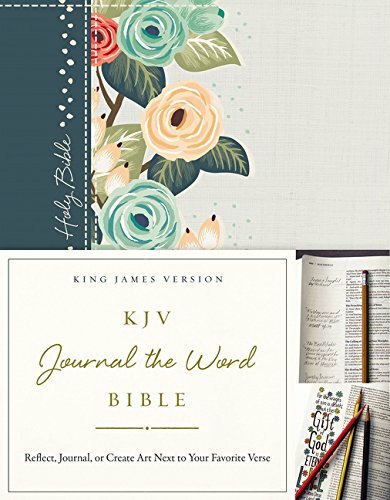 This KJV journaling bible is one of the best bibles for journaling for those who like to take notes, color, and doodle as well. This King James Version Journaling Bible is formatted in a single column design so that it leaves a lot of room for your journaling. The Bible allows for ample journaling thanks to having two margins that are ruled and around two inches thick. Here you can take all your notes, scribble down your reflections or creatively express yourself in any other way you feel moved to do so. Content – This Bible features both the OLD and New Testaments in the King James Version which is a very popular version for a number of Christian Denominations. Included throughout the Bible are not only the words of God as typically found in a Bible but there are also a number of artwork and line art illustrations. Artwork – The My Creative Bible KJV version comes with line art illustrations spaced out throughout the Bible. These lines art illustrations can be colored and allow you the ability to truly make the word of God a personalized work of art. The artwork utilized in the Bible is there to help the reader to truly embrace the word. There are almost 400-line art illustrations that are hand drawn. You will find an index of these so you can even choose what you want to be creative about. Cover – This edition features an aqua colored imitation leather hardcover. The cover features Titles in silver and imprinted with debossed techniques. The imitation leather used on the cover of the My Creative Bible KJV journaling Bible is called LuxLeather and has a very similar look and feel to real leather. The Bible features a lay flat spine which is a very important feature when considering the best Bible for journaling. Typography and Paper Quality – The paper color in the My Creative Bible KJV version is a cream-colored paper. The paper is of the highest quality and all 1410 pages are thick enough to live through your doodling, coloring, drawing, and note taking. The page edges are beautifully printed and the font type is your standard Bible text size of 8.65 with text in black lettering is black as is customary of Bibles. Add On’s – there is a ribbon page marker along with an elastic band attached to keep the Bible closed as well. There is also a Presentation Page so this Bible could be purchased as a gift item and presented nicely as such. The Inspire Bible NLT: The Bible for Coloring & Creative Journaling has won a number of accolades. In 2016, this bible won the ECPA’s Bestselling Bible award. In 2017 the Bible was even more popular making its way as a finalist for the ECPA Christina Book Awards in the Bibles category. It won the Christian Retailing’s Best Award for the category of Journaling in 2017 as well. 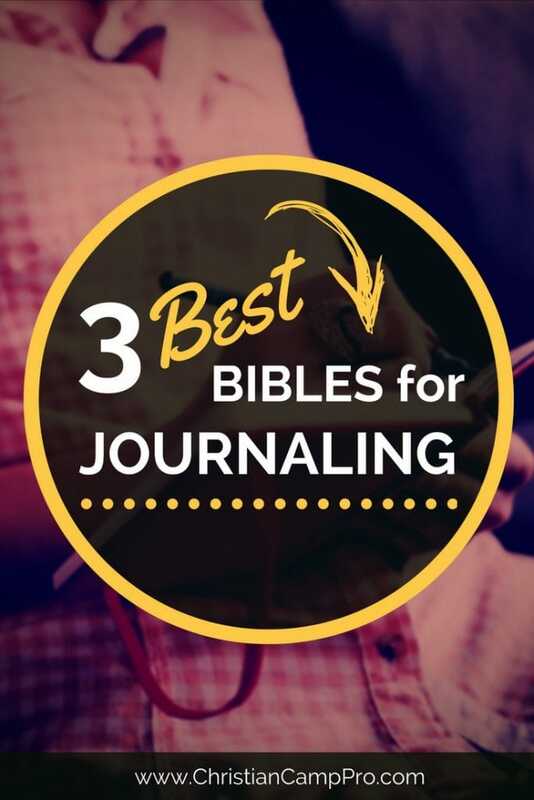 That last award makes us confident to say that this is indeed the best bible for journaling for anyone. This Journaling Bible is a great gift option and is the type of gift that will be enjoyed by anyone with an artistic streak. This Bible can be enjoyed by kids and adults alike as each reader delves into the word of God and allowing its inspiration to be reflected in your ability to make your Bible uniquely yours through coloring. Format – The Inspire Bible NLT – The bible for Coloring & Creative Journaling features a single column format so that it can provide you with wide outer margins. It is in these wide outer margins that you will find your line art to color. The margins on each page measure at to inches and some pages will use this space for line art while other pages will have ruled margins for you to take notes, write down your thoughts etc. Artwork – This Bible features more than 400 pages of line illustrations for its readers to get creative with. There is also full-page art along with partial page art allowing you to interlace scriptures with your creativity. The quality of the artwork is excellent and can be appreciated by coloring book and art journaling enthusiasts as well as the average joe. Translation – this journaling Bible features the NLT translation – New Living Translation. This translation moves from Greek and Hebrew texts into modern English. It is also the revised version of the Living Bible translation. Typography & Paper – This bible utilizes font size 8.65 which is around the standard for Bibles. This ensures readability. The Bible’s pages are cream colored and are thick enough to prevent bleed through from most colored pens. The page is thick enough to withstand the stresses of journaling, pen, crayons, and watercolors. Cover – This is the hardcover edition in an aquamarine blue. 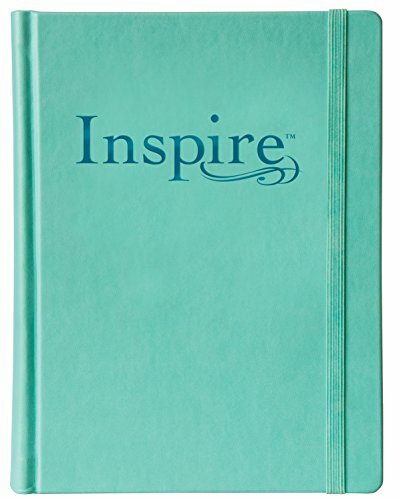 The lettering “Inspire” is engraved in a darker shade of blue and the Bible features an elastic to keep it closed. There is also a matching ribbon marker on the inside. 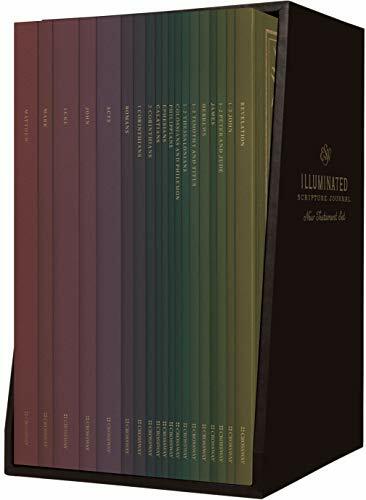 The Hardcover is an imitation leather over board material and page edges are the full color for a flattering contrast to the solid colored cover. The ESV Illuminated Scripture Journal New and Old Testament Set will help you to really get an in-depth study into the word of God completed. Both Bible sets come with each book having blank pages that are dotted in the New Testament and lined in the Old Testament set – these pages are where you can jot down your thoughts and notes as you are inspired as you read the word of God. Each set has individual books for each Book of the Bible contained within. The Bibles are designed so you can engage with the Word of God. Bibles in these set are ideal for use for personal Bible reading, small group Bible study, deep personal Bible study, note taking, art journaling, sermon preparation and so much more. Their versatility truly makes them the best bibles for journaling. Typography & Paper – The ESV Illuminated Scripture Journal New and Old Testament set feature blank pages that run alongside bible text. These pages are dotted in the new testament set and lined in the old testament set. Both sets feature a type font of 11.75 which is quite large and ensures enhanced readability. The pages are opaque, cream colored and thick to live up to daily uses, multiple uses and also note taking and art journaling making these the best bibles for journaling. Format – These Bibles feature a single column format with scripture on one page and a full page for note taking next to it. These pages make it possible for you to take extensive notes making these Bibles a lot better than your standard all in one journaling Bibles. Along with note-taking pages, the Bibles feature large margins allowing even more space for them to be the best Bibles for journaling your creativity and note taking. Cover and Binding – Each book of the ESV Illuminated Scripture Journal New and Old Testament set features lay-flat binding and covers feature gold foil stamping. Artwork – Throughout the New Testament set you will find gold ink, hand-lettered illustrations provided by Dana Tanamachi. You will find these interspersed throughout the blank pages allowing you to add your reflections or your very own accompanying artwork. Size – Each book is sized 5.75 inches by 8 inches. The books are thin and extremely portable so they can be taken pretty much everywhere without inconvenience. Translation – ESV: The English Standard Version Translation of the Bible was first published by Crossway in 2001. This translation is the Standard Version revised and it provides an essentially literal translation of the Bible into English. The ESV Single Column Journaling Bible is a great choice for individual Bible reading. 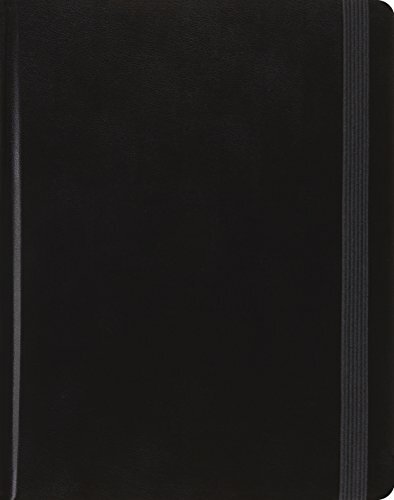 It can easily be called the best bible for journaling thanks to its design which allows an entire page for journaling. A full page for all your notes, prayers, thoughts, scribbles, doodles and more. Featuring the 2016 ESV translation this Bible presents the word of God in plain and easy to read modern English. Designed as a journaling Bible this is one of the best Bibles for journaling thanks to its design. Wide ruled margins allow enough space for all your notes. The thick paper makes it easy to take notes and not have to worry about your pen bleeding through to the next page. With this journaling Bible, you can journal on every page. Typography & Paper – The ESV Single Column Journaling Bible features 7.5-point Lexicon Type font. While smaller font size than average the Lexicon Type font makes the Bible easy to read in any case. You will find the Headings and verse numbers very bold so those are very clear and stand out easily. The font can be found on thick, opaque, cream-colored paper. The cream color is a bit darker than typical but this does make journaling a lot better and prevents bleeding through of your writing. Binding and Cover – This edition is a black hardcover which makes the bible very durable. The included elastic strap helps to keep the Bible closed. With sewn binding, you can easily have this Bible stay open and flat as is necessary for one of the best Bibles for journaling. Format – The ESV Single Column Journaling Bible comes in a single column format. The Bible verses are set in paragraphs while you will find poetry its layout all verses of OLD TESTAMENT are centered and placed in quotation marks. Outside margins are 2 inches wide and are lined for you to write. Each line of text features a margin line so you can journal alongside the text. Add-On – Outside of the above-mentioned features there are a couple of smaller features that are worth making note of. You will find footnotes at the bottom of the pages that are linked to numbers in the text. In these footnotes, you will find explanatory notes, Greek translations, Hebrew translations, alternate translations and, even technical notes. There is additionally a table of weights and measures along with three reading plans; one from the Old Testament, one from Psalms and one from the New Testament. The ESV Single Column Journaling Bible also includes a ribbon so you can save your place to continue later. 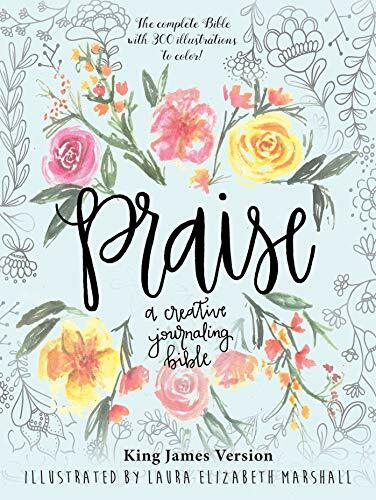 The Praise: A Creative Journaling Bible is one of the best Bibles for journaling for the feminine artist and God lover. It is a great gift item and also a great choice for a personal purchase. The front is beautifully decorated with flowers. The title is hand-lettered onto the hardcover which is light blue in color with floral designs on the front. The back features the same base light blue color with text showing the overview of the Bible. There are three flowers strategically placed around the text to add to the feminine touch of the front of the Bible. Cover & Binding – The Praise A Creative Journaling Bible features a light blue hardcover with hand lettering on the front. The title is debossed in black ink into the cover of the Bible. The Front features the name of the Bible as well as the translation used within and the name of the person that completed the over 300 illustrations that can be found within the bible. They advertise the cover of the Bible to be of Keepsake quality and it is indeed a beautiful cover. The Bible features a sewn spine. Artwork – There are over 300 artistic illustrations to be found in the Praise; A Creative Journaling Bible. The illustrations found within the Bible are done by Laura Elizabeth Marshall. The artwork found inside is similar to the type of artwork you will find on the cover of the Bible. You will find some artwork that is not as fluid and that may come off as more clip-art-is and rigid but they are still pleasant. Journaling – The Praise: A Creative Journaling Bible is designed for being one of the best Bibles for journaling. It is ideal for note-taking doodling and coloring. Along with the illustrated drawings for you to color you will find lined margins which allow space for you to take notes, make note of prayers and anything else you may need to jot down as you read. All margins that do not have an illustration will feature lines for writing. Format – This Bible features a single column, wide margin format. The text is a 9-point font size which is larger than most other bibles making it ideal for even those with a bit of visual impairment. There is no thumb index but you will find an included ribbon marker. Margins include a mixture of illustrations and ruled lines so you can alternate between artistic journaling and regular note taking, making note of your questions etc. The edges of the pages are gold colored to give the bible an additional touch of class and beauty. Truly reading and journaling the Bible can be considered a perfect match as both methods can help you retain important information. Expressive writing cannot only aid one’s productivity, but it can also be a good way to heal – emotionally and psychologically. Find the answers to your questions and rediscover yourself with the help of Bible reading and these best Bibles for journaling.